I bought the Spark two days ago and was having all sorts of rc linking and wifi connection problems. After I solved them, I was getting Switch WLAN region message everytime I start DJI GO app. I hit back and hit go fly, not a big deal really, except if I hit OK accidentally, I must hard reset wifi on both rc and drone and relink them, which is very frustrating. So I've decided to go with NLD mod and their patched app. So far it works good after a short test. Any NLD users here? Is NLD mod and app reliable and safe? If someone is using it for a longer time, I would appreciate to hear the opinion and experience thoughts. It was quite an easy flash. Choose the values and tweaks, just hit apply, that's it. I was using .800 firmware (MOD showed .900 for some reason). Gonna fly Sparky today to test the mod, will report back. +1 for NLD. It simplifies parameter changes and is user friendly compared to manually doing all the steps. But my main question is - is it safe and reliable? I'm quite new to Spark and drones generally, only flew ONE flight with my smarthpne since I had troubles linking RC to the Spark. Now when I sorted all out and applies NLD mod to get rid of Switch WLAN region message, I'm ready to do my first real flight, but I'm a bit scared should I use this mod on a first flight, or at all. As reliable as DJI built it. NLD only changes what's available for editing via DJIs own software. I have few questions still. I will use OTG cable, so what video feed bitrate is the best option? How do you download HERE maps satellite layer? I've used DJI GO 4.1.14 to patch it. Is recommended 4.1.3 better bet, or 4.1.8? I use the patched 4.1.15 app with Google maps and it works much better. Video bit rate I never paid attention to actually. hm, so I must download original 4.1.15 and use it to patch it in nld? What version Ishould choose in NLD then? Ok, did two flights with NLD and it was amazing. - app keep switching to 5.8ghz, limiting my range to ~800m. I selected 2.4ghz and tapped Apply, and after few seconds it switched to 5.8ghz again, not sure why I was in a field far from any house. - Spark won't fly faster than 10km/h in Normal mode, but would fly 20kmh in Cinematic mode, wth? Only thing I've changed in NLD is raising the vertical speeds by 1m/s. Speed section is untouched - 10m/s. In Sport mode it was fast, around 40km/h. 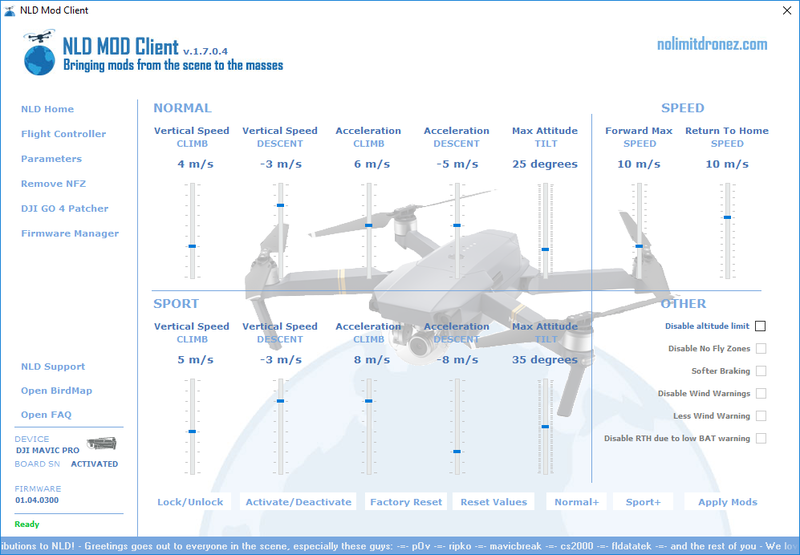 Not sure why it flied only 10kmh in Normal mode? - In Sport mode, bank and yaw were so strong that gimbal couldn't keep up. Is that normal with factory unmodded Spark, or just with NLD (didn't touched bank values in NLD)? This is the first I've heard of NLD, but I'll be looking into because I don't like Sparks default speeds: Tripod mode max speed 2.5mph, P Position mode (GPS) with obstacle avoidance enabled 6.X mph, P Position mode (GPS with obstacle avoidance disabled 13.X mph, and Sport 30.X mph. You can use Sport mode in any speed up to 30mph. I prefer 17 to 20 mph because at any elevation above 125 feet 6.X and 13.X are too slooooooooow, but 30mph results in camera shake. Sport mode is FPV gimbal, and that insane bank look is horrific, and nothing can be done about it. I would be surprised if NLD, or any third party app could fix that. I'm thinking that if we are going to yaw/turn while in FPV mode we just have to go for it. By that I mean lean into the turn and stay in that pseudo fixed wing mode for a while. Obviously, you can'g go extreme or Spark will just turn in circles. My spark (stock) switches back and forth even if I set it to 2.4g and the gimbal doesn't keep up in sport. Ok, so I must either turn off obstacle avoidance, or apply Nomal+ mode in NLD. Will test both soon I hope since it will rain here for couple of days. how long does it actually takes to downgrade firmware? I started with 3 solid battery lights and the battery fun out of juice, and i am still at Phase 20....btw, i am down grading the bird to 01.00.0300, do i need to flash my remote to a matching firmware for the mod to work? another question, since nld has enable the waypoint mode in spark, has anyone try using litchi/drone harmony waypoint with spark? So if anyone knows what to turn of it willbe nice! Anyone knows how to switch to 2.4ghz with NLD app? I'm in EU so 5.8ghz is not the best option, can reach only 800-900m in fields, far from any house. When I try to switch to 2.4ghz, Spark disconnects and I can't find Spark RC anymore on WiFi, or switch the connection back to 5.8ghz, can't remember exactly. And yes, I'm using OTG connection. Also, I'm currently on firmware .0800 for Spark and .0300 for RC due linking trouble with the latest. Do you guys use latest firmware or ...? Not sure is ti safe at all to use .0400 firmware for Spark, it is pretty an old one. Can someone share their values in NLD Mod Clien, Flight Controller section? I have trouble understanding SPEED, and Acceleration. 10m/s is 36kmh, but top speed i still around 50kmh in Sport mode, so I'm confused. Also what is acceleration for climb and descent? Vertical speed is self explanatory, but acceleration isn't at all. I want to set max speed in normal mode to 25kmh (without obstacle avoidance), and keep max speed around 50kmh in Sport mode. Not sure how I can adjust that using SPEED section only, it will affect also Sport mode max speed. I guess Max Attitude should be changed too? God, this is so confusing. Do you guys have any info what is the best combination of firmware versions to use with NLD? .0800 for Spark and .0400 for RC? I've heard that .0900 has a problem with shorter distance. I downloaded NLD today for both the Mavic Pro and Spark, this post pertains to the Spark of course. I'm also wondering what firmware is working best with the Spark. I have been running the most current on the Spark, but inconsistent flight distance is killing me. Same location same everything, one day I'll get 6,000+ feet the next only half that around 3,000 feet. Using DJI Go 4.1.15 and current firmware with Custom NLD settings.